This article highlights the symbolism behind Hurricane Harvey and Hurricane Irma. Quick visual summary of the rod, eagle, dragon fractal images. What is a Bible Fractal? 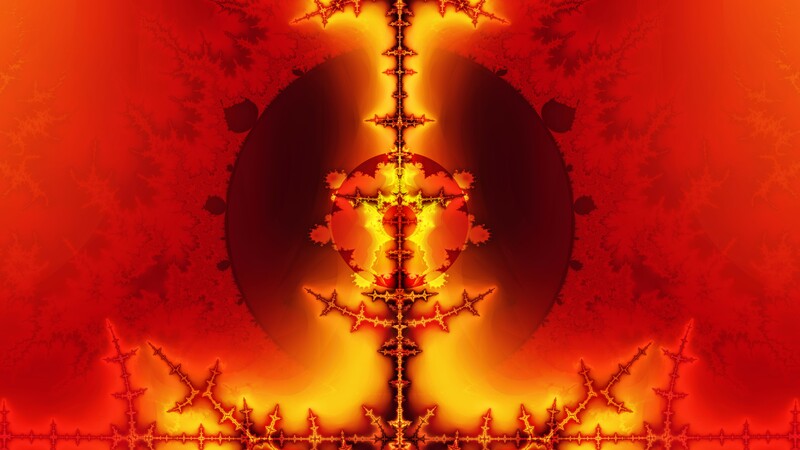 The Bible-fractals seen here are produced by Bible numbers, and will be explained periodically. Bible fractals are not naturally drawn images, but result from mathematical formulas, and in this case, derived from the Bible. They are supernatural because fractal geometry belongs to another dimension of reality. They are supernatural because every image came by revelation, with powerful signs following. It is God’s math producing order out of chaos! The lower part of the snout of the dragon is seen here too. 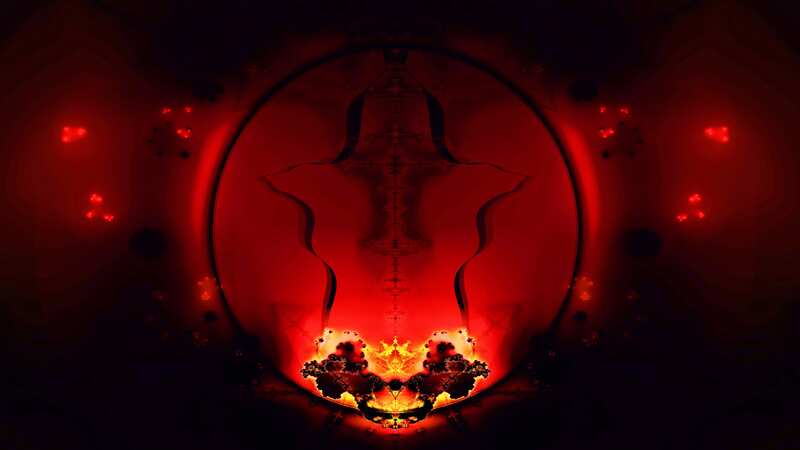 The head of the dragon looking down to spew a river after the women is the size of the moon-earth-sun in eclipse, as seen in subsequent images. The women has a crown of 12 stars along 5 spokes. Below is the same image, but the entire sun is visible. A tremendous flash of lightning shoots forth from the cry of the eagle as it flies from the sun, like the blast of a CME. (Click to enlarge Bible Fractal image.) The flash of lightning from the eagle’s mouth runs horizontal, and is actually larger than the more spectacular one over the seven hills. (Click to enlarge Bible Fractal image.) The blazing measuring-rod of God. Harvey moved like a serpent and Irma was shaped like a serpent: Each spewing out a flood! (Click to enlarge.) 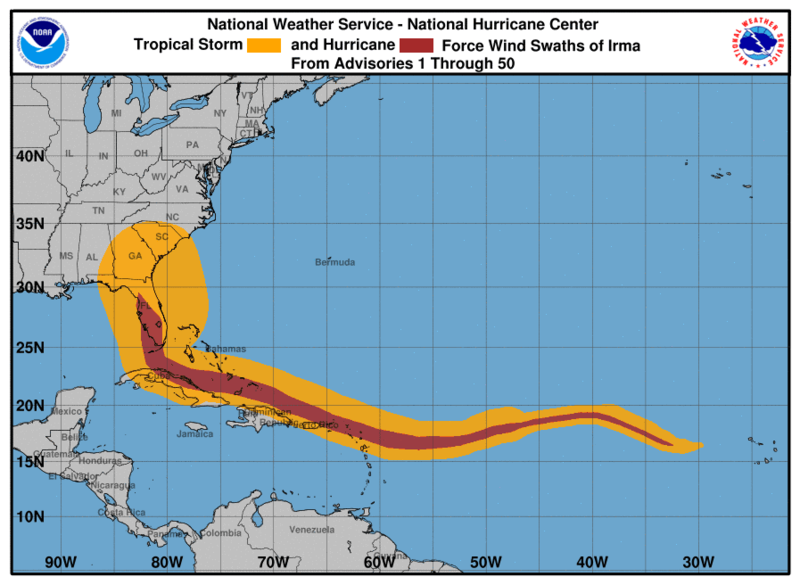 The hurricane winds of Irma seen in red, look like a serpent, head raised, about to strike, with the eye being the large lake in Florida. The serpent is eyeing Cape Canaveral. It reminds me of the Dragon in the Book of Revelation who is also likened unto a “serpent”who spews out a flood. (As seen in the above video), the path of hurricane Harvey moved like a serpent as it “spewed out a flood” over Texas. The bible speaks of two magicians (Jannes and Jambres), whose rods were swallowed up by the rod of Moses. (2Tim 3:8). This is the first time that two cat. 4 hurricanes made landfall in the US in the same year. Moreover, they both occurred shortly after the ominous total solar eclipse across America, and both look like a serpent! At the very least, God is reminding us of the Exodus. But who knows, maybe the exodus for the church itself draws near? I wrote several articles about hurricane Dean back in 2007 because Dean occurred exactly 1150 days after the discovery of the Balance Bible Code, just as Harvey occurred 1150 days after the discovery of the fractal image, (as explained already. For “1150” see Dan 8). Here is what I wrote about Dean exactly 10 years ago, along with the image of Dean’s hurricane winds. Dean’s path resembles a rod because it traveled a vast distance across the ocean and Gulf in a straight line. I wrote about how that it resembled a rod back in articles from 2007. Katia, Irma, and Jose. Katia landed less than a day after the massive 8.1/8.2 earthquake opposite to it on the Pacific side. Aztec pyramids shook! (Click to enlarge.) 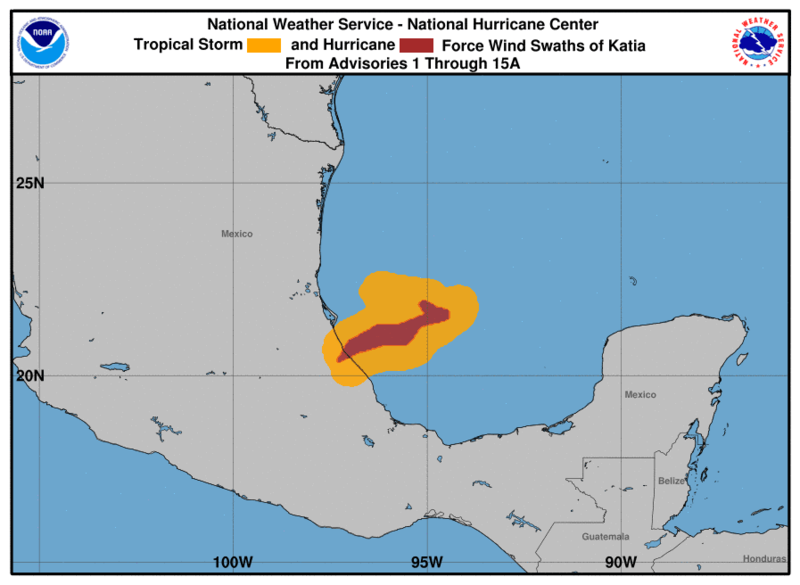 Katia’s hurricane winds (in red) at extreme end mark the Aztec site, “El Tajín” . On my monitor I studied the above image of hurricane Dean, carefully plotting the exact coordinates of Dean and Katia on a map. It was still on my screen when later that day as Irma moved into northern Florida that I realized that Irma looked like a serpent. “And there shall be signs in the sun, and in the moon, and in the stars; and upon the earth distress of nations, with perplexity; the sea and the waves roaring”(Luke 21:25). What is so important about where Dean and Katia landed? 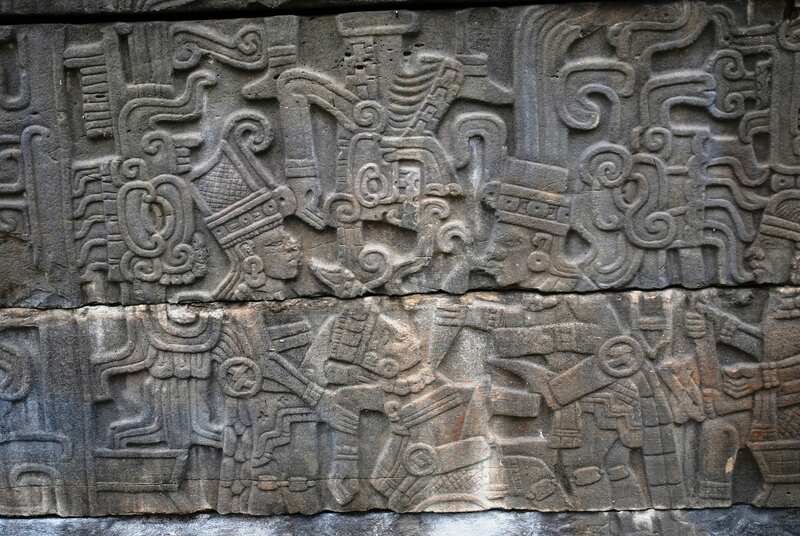 As it turns out, Tecolutla is located near the ruins of El Tajin: the place of the Dead, the gate to hell, the place of dragon and serpent gods. It’s the place of the counterfeit seven-leveled pyramid of God, with 365 entries honoring the sun, moon and stars. 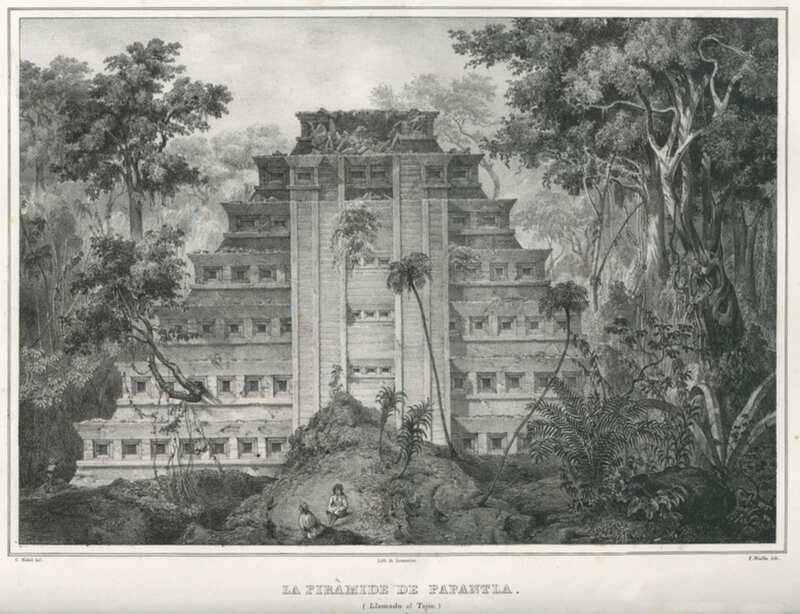 In a sense, El Tajin is ancient Babel of North America! It’s where brutal games of death and life were held above all other places. It’s the hellish place of endless human sacrifice and brutality. The Nephilim! The paradise of New Agers! What better place for a contest to show who is the true God that really controls the weather? Beheading Panel Tajin. Losers in the games were sacrificially beheaded! Pyramid of Niches. Seven levels; 365 niches. You can read more about this horrid site at Wikipedia, or join the deluded 650,000 who pay homage there every year! So what is God saying by Hurricane Harvey and Irma? Even the dragon, even the serpent is under our authority in Christ. For just as Moses’ serpent swallowed up the two serpent’s of Pharaoh’s magicians, and thereby incorporated there rods into his own, so that thereafter the head of pharaoh’s serpents were ever underneath Moses’ feet wherever he went, in the same way the believer has more authority over the serpent-dragon than they ever imagined. But for now her eyes are dim and does not realize it. But you are seated with Christ in Heavenly places. Even the wrath of the Dragon must praise Him! Even the serpent, even the Dragon is under God’s control and under our control in Christ. So do not be afraid of the storm and of the wind that can only destroy the body but not the soul, but fear God and walk as children of God, not as mere men. Your rod will swallow up the Dragon just as the earth swallowed up the river spewed from the Serpent’s mouth. What rod am I talking about? Be strong therefore in the power of His might. 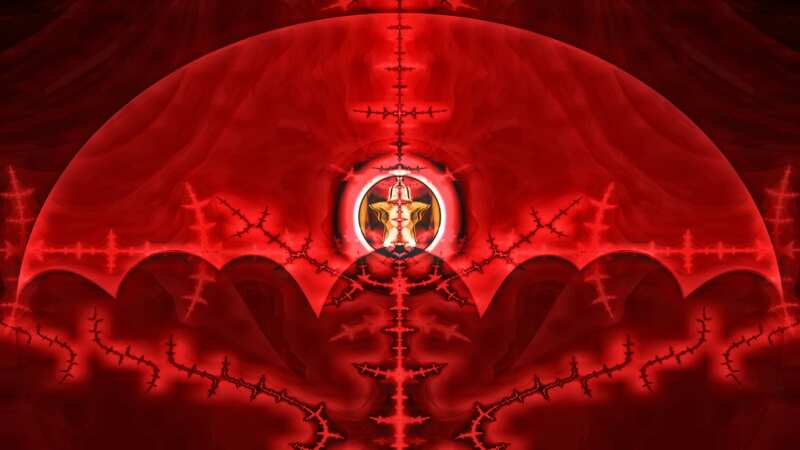 I ask you, does the woman who rides the eagle in the image in the bible-fractal look like she’s afraid? powerless? weak? No! Instead she looks fierce. And she has a bow located behind her head, ready to shoot lightning bolts. She is a warrior. Not a coward. She is like a warrior goddess, except in a Godly sense, which is what the name Irma means. 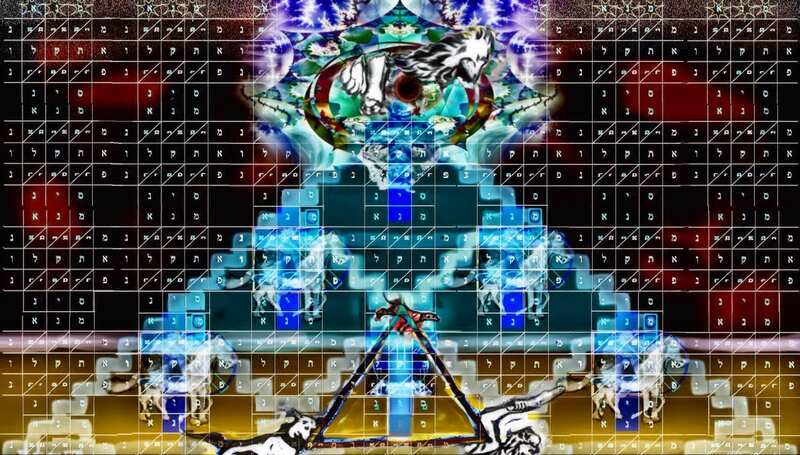 This Bible fractal is what you look like seated with Christ at His footstool in Heavenly places. Don’t ask me how you can be in two places at once. But I assure you, it is so. Come up higher On Eagle’s Wings, and see things from God’s perspective! (Click to enlarge.) 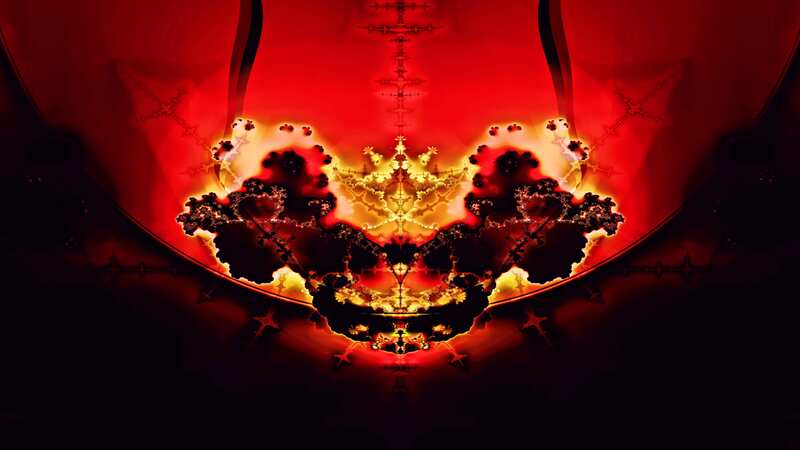 Fractal image of the women given the wings of a great Eagle. The woman represents the Earth itself, as well as Israel and the Church. (Revelation 12). 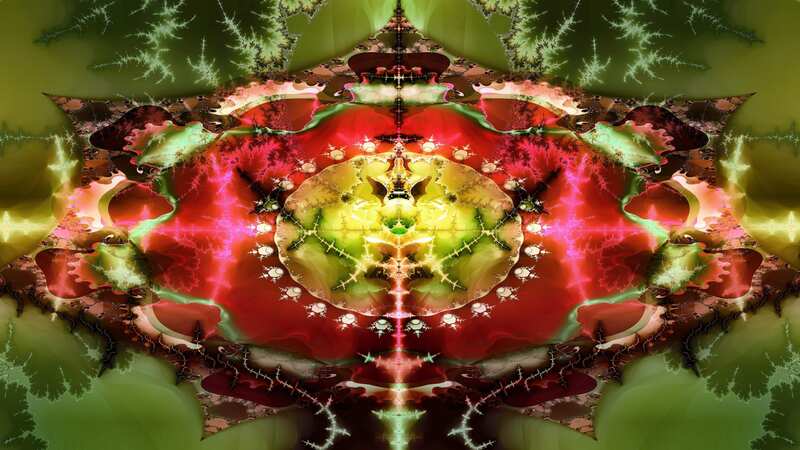 Whenever you look at these fractal images do not think in the natural, think in symbolism. The Bible is highly symbolic, especially the Book of Revelation. Everything is symbolic of something greater. Does the woman look like the Earth that’s groaning with birth pangs to give birth to the children of God as the Bible says in the Book of Romans? The women is meant to resembles the Earth with desert life. This is why she flees into the “desert” as it says in Revelation 12:14. Eventually she will be like a well-watered garden. But for now we wait for the full adoption of the sons of God. Allow the Word of God to interpret the fractal. Do not impose upon it your own vision. Hello, i just started reading this and I found it incredibly interesting. I think you are doing an awesome job with all of this. 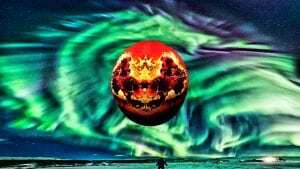 I am a student of mathematics and i have looked at fractals a bit before but never to the extent of studying, although this has kind of inspired me to look more into it. I mainly wanted to comment because i live in Cape Coral FL. I was here during Irma and some interesting stuff happened… theres also some other patterns too. But mostly there was some more anomalous things that happened compared to other hurricanes I have experienced. I live on the west coast, close to the gulf of Mexico. Our bays from Key West to Tampa, beaches and the caloosahatchee river drained. It was quite a phenomenon.. once i was able to research a bit more it seemed that the majority of the storm surge affected the east coast. There ended up being a little bit of flooding here later but it was mostly down in Naples and basically larger pools spread randomly here and there, some more flooding further inland, but that was about it. It definitely was not nearly as bad as everyone assumed it would be. Sorry if this isnt too interesting, i just thought id at least comment since i had the experience of it and i think your works here that i have read so far are great. Thank you for your encouragement and eyewitness account, even if the event was not as severe as expected. That’s a good thing. Blessings on your research. Thank you! You give me the courage to stand and speak Gods true words in faith and strength. All good information-spirit told me about Irma about one year before it happened, but I spelled it with an “E”. 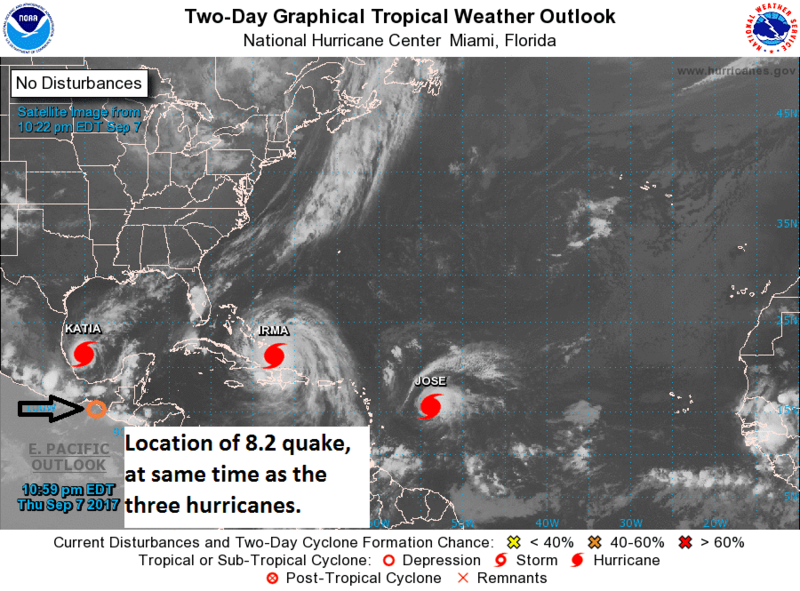 I had noticed that the three hurricanes that hit the USA was during the 40 day period of Teshuvah (repentance.) Harvey, Irma, Maria. Take the fist letter from these storms and it spells “HIM.” We are to repent and turn to HIM during his time. The hurricanes are storms from the HEAVENS….a Sign from HEAVEN (GOD) ………..war in the HEAVENLIES…….and the earth (mankind, unbelievers) below QUAKES……..and the Sea (filled with demons) roars and surges.